The JSP lens cap are used to protect your camera lens from scratches, dust, dirt, moisture and fingerprints. Also serves as a permanent lens protector and a much cheaper alternative to the branded equivalent.Excellent design with double action springs, simply squeeze cap sides and place it on a lens.Made by high quality plastic to achieve light in weight and good in shape. Unique ergonomic snap-on design makes it easy to snap on/off , even when a lens hood is attached to the lens. A keeper strap is also included. Please note that these JSP lens caps are high quality optical products created for and marketed by JSP – a very reputable photographic UK wholeseller with more than 30 years of experience. Our people have tested many products & suppliers in their quest to find the best products for you. Q: How do I choose the proper size? 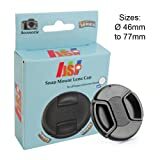 JJC 55mm Plastic Snap-on Lens Cap with lens cap keeper for Cameras and Camcorders - Canon, Leica, Nikon, Olympus, Panasonic, Pentax, Samsung, Sigma, Sony etc. This entry was posted in Discount Photography and tagged 72mm, Canon, Cover, Fuji, lens, Nikon, Panasonic, Pentax, Sigma, Snap, Sony, Tamron by Ball Photo. Bookmark the permalink.